Quoted in the Cornish Times as ‘the highlight of the day’, the Cardboard Boat Race of last year’s Regatta was a tremendous success. The challenge of this event is to create a boat made entirely out of cardboard, which can hold up to two people, and can be paddled from the slip way to a point on the Tamar and back. This year, the Regatta Committee would like to invite you to get creative and enter into the fun! The competition is open to individuals, local businesses, schools, clubs, organisations or anyone who would like to have a go. 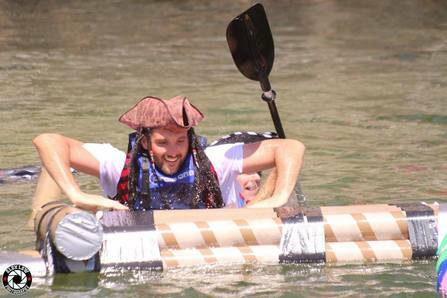 All you need is a cardboard boat, a team name and a sense of humour! Prizes to be won this year are for the most impressive sinking, the fastest boat, the most creative design and overall winner of the competition. The competitors will need plenty of support so if you are not taking part, come along and give them a cheer and enjoy the spectacle on the Ashtorre slipway on Saltash Waterside. 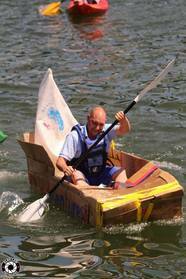 The Cardboard Boat Race is organised by Redeemer Saltash Community Church Group on behalf of the Regatta Committee.